Sutter Roofing and Sheet Metal has a quality team of roofers serving Santa Rosa, and we are a local roofing company that has been in business for over 25 years. Our longevity as a roofing contractor in Santa Rosa is a testament to our quality craftsmanship, customer service, and fair pricing. Many clients seeking a roofer in Santa Rosa know they want quality work done in an efficient manner at an affordable price. From the beginning, Sutter Roofing and Sheet Metal has been a roofing contractor that embodied these qualities. Today, Sutter Roofing is recognized as the one-stop leading roofing company in Santa Rosa and Sonoma County. We provide homeowners with the highest quality systems using only the very best materials. We are a licensed sheet metal contractor and have control over the quality and price of our gutters. Sutter Roofing integrates the highest level of craftsmanship and quality with integrity and customer service. Each job is given the same level of care and attention to detail. If you need a roofer in Santa Rosa, or require an expert roofing contractor’s opinion on a building in the Greater Santa Rosa area, contact Sutter Roofing today at 707-829-5050. You’ll be satisfied you did! 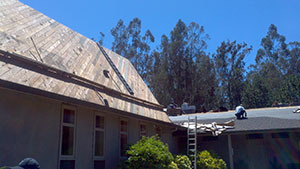 We are your one-stop leading roofing company in Santa Rosa and Sonoma County.